The Secretary to the Government of the Federation, Mr. Boss Mustapha, on Sunday, said the victory of the APC in Saturday’s by-election for the House of Reps in a Federal Constituency in Kwara State was the “sweetest” so far. The APC also won the by-elections in Bauchi and Katsina states to fill vacant House of Representatives seats. Mustapha spoke at the inauguration of President Muhammadu Buhari’s 2019 campaign document, “The Next Level” in Abuja. Meanwhile, the Minister of Information and Culture, Alhaji Lai Mohammed, and Kwara State chapter of the Peoples Democratic Party also on Sunday disagreed over the result of the by-election. 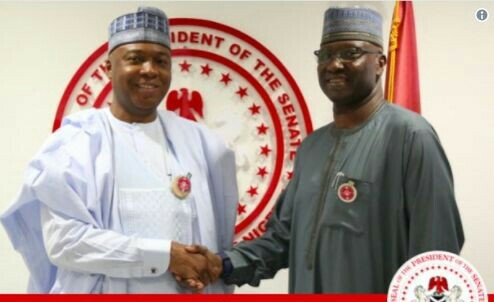 While Mohammed said the result was an indication that the President of the Senate, Bukola Saraki, was no longer in control of the state, the PDP rejected the result which it described as daylight robbery. Addressing an APC victory rally in Oro on Sunday, the Minister said, “Many people believed that Saraki could not be defeated in any election in Kwara State. “We have proved him wrong that he is in control of the state; yesterday’s (Saturday) election result has proved him wrong. “What gave us victory in the Saturday election was the absence of political thugs and the neutrality of security agencies,” he added. Also, the chairman of the state chapter of the APC, Bashir Bolarinwa, said the election result showed that people of the state had decided to hold their destiny in their own hands and decide their fate. But while addressing a press conference in Ilorin, the state chairman of the PDP, Kola Shittu, described the election as a charade and direct assault on the nation’s democracy. Shittu alleged that the election was characterised by snatching of ballot boxes and illegal arrest of members of the PDP among others. He called for the cancellation of the election, saying it fell short of the expectations of the people of the constituency. The party chairman said, “The PDP condemns in strong terms the conduct of the by-election and rejects its outcome, as it does not reflect the will of the people of Ekiti, Oke-Ero, Isin and Irepodun local government areas. “The announcement of the candidate of the APC as the winner of the election by the Independent National Electoral Commission is a daylight robbery, subversion of the will of the people and direct assault on the nation’s democracy.